I was unsure if I should entitle today's blog, "Anti-climax of Aix". 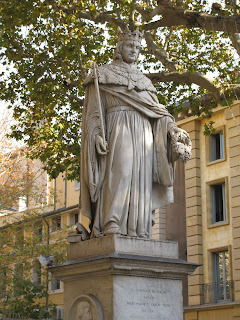 For so long, I had looked forward to visiting Aix en Provence - the birthplace and long-time home of Cezanne. At one time, we were very close to booking our two week stay in Provence there. I am so glad we chose our quaint provincial village instead. Aix certainly is a lively city, with an obvious young University crowd. There is a plethora of cafes and restaurants, and the usual upmarket stores. Museums and art galleries are dotted through the winding, interlocking streets. However, the anticipated beauty of the fountains and tree-lined avenues turned merely to disappointment. The main street of Aix, Cours Mirabeau, was flanked with temporary wooden stands awaiting the Christmas market installation and the two fountains I could see lay dormant and dry. Even the trees looked autumn-weary. I felt deflated. Lunch at one of Cours Mirabeau's cafes was also overpriced and ordinary. Aix's only saving grace today was the lovely Musee Granet, which houses paintings by many wonderful artists including Cezanne.